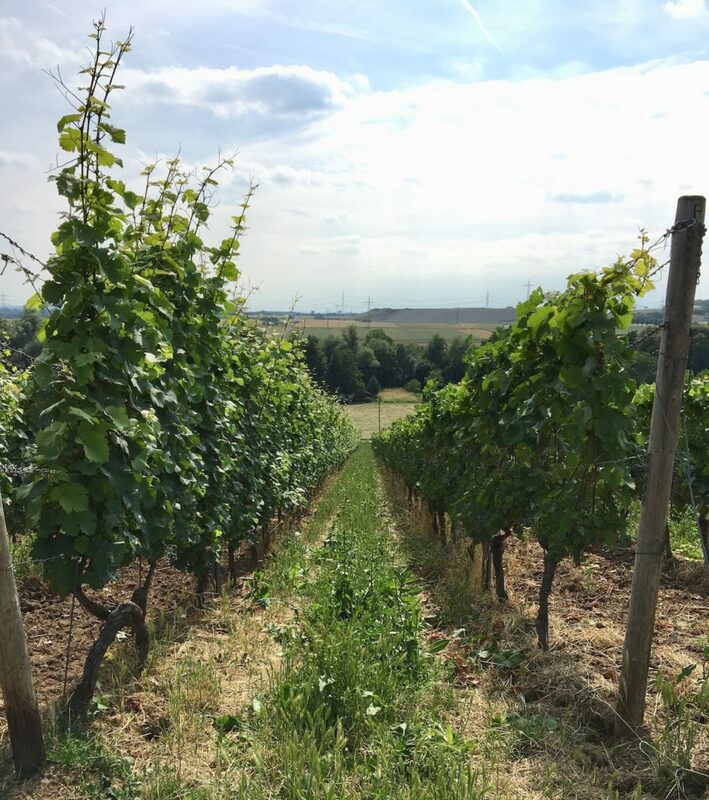 Since early March 2019, when I began work for the Gut Hermannsberg (GHB) wine estate in Niederhausen in the Nahe region of Germany, the focus of this blog has certainly shifted. Here’s proof that it is by no means limited to stories about GHB. 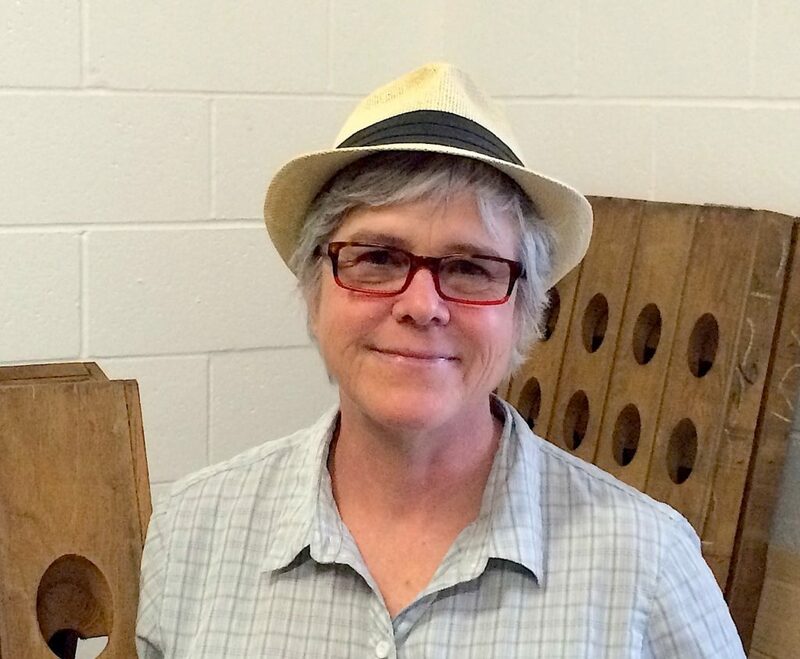 Recently winemaker Dr. Nancy Irelan of Red Tail Ridge estate winery in Seneca Lake/FLX (Finger Lakes) in Upstate New York was recently on the list of semi-finalists for one of the James Beard Awards – the “Oscars” of food and wine in America – but she didn’t make it to the finals, much less has she won the award itself. I’m sure that she doesn’t see it this way, but I think you could say that once again she has been damned with faint praised. You see, again and again during the dozen years since the winery released its first wine people have said nice things about her, but nobody ever publicly celebrated her special form of genius. Maybe it’s because she never did or said anything outrageous enough to abruptly drag the world wide web’s attention to her. Maybe it’s because she’s a strong-willed, highly intelligent and extremely articulate woman. Maybe’s it’s because she doesn’t neatly fit into any of the established roles for women winemakers. Strangely, I’m pretty sure that if she were a movie director then she’d have a better chance of wining an Oscar, than she has of wining a James Beard Award as a winemaker! But let’s begin this story in 2004 when Nancy and her husband Mike Schnelle, then an accountant and now a self-taught grape grower, purchased a 34 acre parcel of wooded land on the west side of Seneca Lake. At this point, the year of my first visit to the region, the reputation of the FLX was a pale shadow of what it is today. The first planting was 3 acres of various clones of Pinot Noir that went into the ground in the spring of 2005. However, a huge storm of the kind locals call a “gully washer” hit just a couple of days after it went in and the rain washed all the young vine stocks out of the ground. Mike was alone at the estate, because at this point Nancy was still Vice President for Victiculture & Oenonolgy RD for Gallo in California. He called her in a panic and she told him how he would have to try and find the vine stocks – they were all at the bottom of the hill – and replant them all by hand. He did that and in 2006 they picked their first crop, just half a ton of Pinot Noir grapes. Nancy turned them into a Blanc de Noirs sparkling wine (to this day sparkling remains of Nancy’s strong suits), “it was yummy,” she says, “sadly it’s all gone now, but one bottle.” Winemaking is a double-edged sword and winemakers have to lick that blade repeatedly. Fast-forward to October 2014 and my first visit to Red Tail Ridge. I was up in the FLX from NYC with my then girlfriend and she insisted we had to visit Nancy. She was right to overrule my skepticism and our first meeting was one of those connections with a winemaker that changed how I think about wine, although in a very non-dramatic way. At this distance in time it’s hard to say exactly what lead to that, beyond stating the simple fact that Nancy is a very thoughtful winemaker who bases her decisions on strong science, but who’s goal can be expressed in one old-fashioned word that she makes liberal use of: delicious! I say old-fashioned, because in the natural wine scene “authentic”, “naked” and “real” have taken over the role “harmonious”, “elegant” and “delicious” play in the regular world of wine. And the natural wine scene’s disdain for the regular world of wine has made those words look increasingly like expressions of out-dated reactionary concepts. Nancy has strong beliefs, not least in the central importance of deliciousness to the wine industry, but she’s never rigid in her thinking. Taking several leaves out of the natural wine scene’s book she makes an excellent skin-fermented dry white wine called “Miscreant” and Pet Nats (short for Pétillant Naturel). However, she also makes elegant dry Rieslings with bright citrus and stone fruit aromas in a style no natural winemaker would accept. Their generosity has a lot to do with the warm site and the limestone soil (unusual for the FLX) there. In the 2016 vintage it also has to do with the warm year she seemed to effortlessly master. You could say much the same about her Chardonnay too, a rare star for this grape variety in the FLX. And those Pinot Noir vines have matured to the point where they give silky and subtle red wines that no Burgundy lover would consider radical or revolutionary. Nancy is a self-confidently liberal winemaker who rejects all forms of dogma and the idealization that so often accompanies it. I used to repeat in mantra-like way the statement, “Red Tail Ridge wines are unspectacularly excellent”, but then along came a red wine called Rebel with a Cause, a blend of Blaufränkisch (aka Lemberger and Kékfrankos in its native Hungary) with Lagrein and Teroldego. It is spectacular in many ways, beginning with that blend. The first of those grapes has a small tradition in the FLX, but the latter pair of Northeast Italian varieties have zero tradition anywhere in North America. The idea of pushing these three together is radical in the extreme and for this reason the name is a perfect fit. 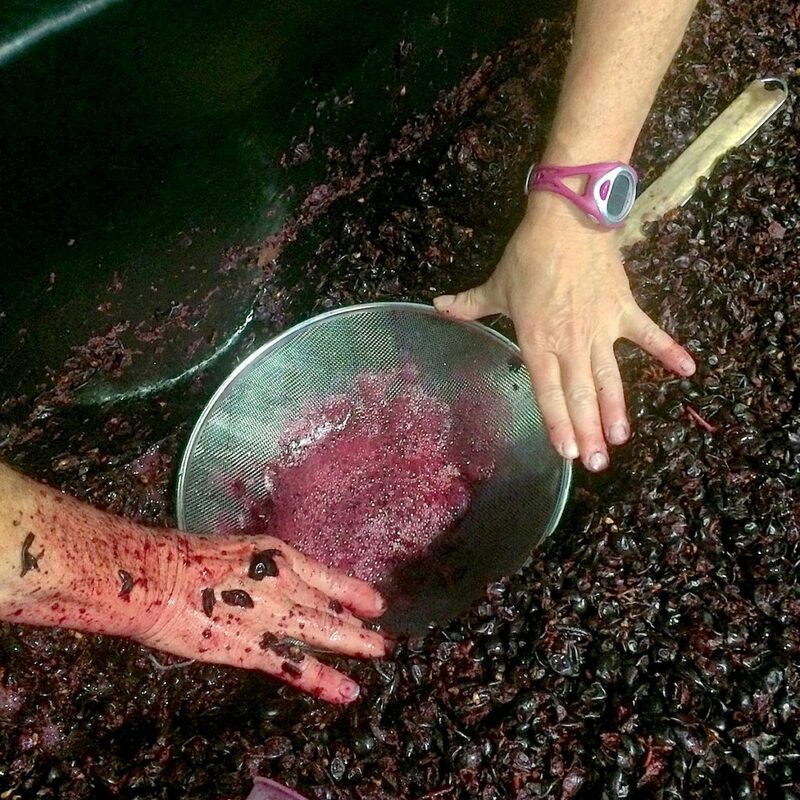 As luck would have it I was at Red Tail Ridge on the 3rd October 2016 during the fermentation of these grapes (pictured above with Nancy’s hands) and could follow the development of this wine almost from Zero Hour onwards. Of course, radical winemaking ideas is one thing and a delicious wine is quite another. Thankfully this bizarre marriage born in Nancy’s fertile mind is a very happy one, though not without a stunning tension that make the 2016 Rebel with a Cause one of the most exciting new reds I’ve tasted anywhere on Planet Wine. And during the last three years I tasted about 25,000 wines from all the wine continents. Just how is it delicious? What grabs me most is the forest berries and wild herbs character and strong, but there’s also the strident yet balanced tannins and vibrant acidity which together give it so much structure. This isn’t a red for the faint-hearted who need a smooth as silk landing, nor is it for those who demand plenty of (reductive) funk in their wines as proof that they’re “natural”. Once again, some people will fail to take her seriously and that’s the reason that the image on the label of Nancy preaching from a pulpit in the vineyard is spot on. Many Estate Rieslings from leading German producers contain some wine from top vineyard sites, but which of them comes 100% from top vineyard sites? Until recently that wasn’t the idea behind the category, but that’s exactly what the 2018 7 Terroirs from GHB is! As the name says, it is a blend of dry Riesling from the 7 VDP Grosse Lage (or “Grand Cru”) vineyard sites in which GHB has holdings. In fact, 100% of the estate’s 30 hectares of vineyards holdings are in these top sites: Hermannsberg (Monopoly), Steinberg und Klamm in Niederhausen; Kupfergrube (12 hectares!) und Felsenberg in Schlossböckelheim; Bastei in Traisen; Rotenberg in Altenbamberg. Viele Gutrieslinge von führenden deutschen Weingütern enthalten etwas Wein aus Spitzenlagen aber welcher stammt zu 100% aus Spitzenlagen? Bisher war das nicht die Idee hinter dieser Kategorie, aber genau das ist der 2018 „7 Terroirs“ Riesling trocken von GHB! Wie der Name schon sagt, handelt es sich um einen Cuvée aus den 7 VDP Große Lagen, (oder auch „Grand Crus“) wo GHB Weinberge besitzt. 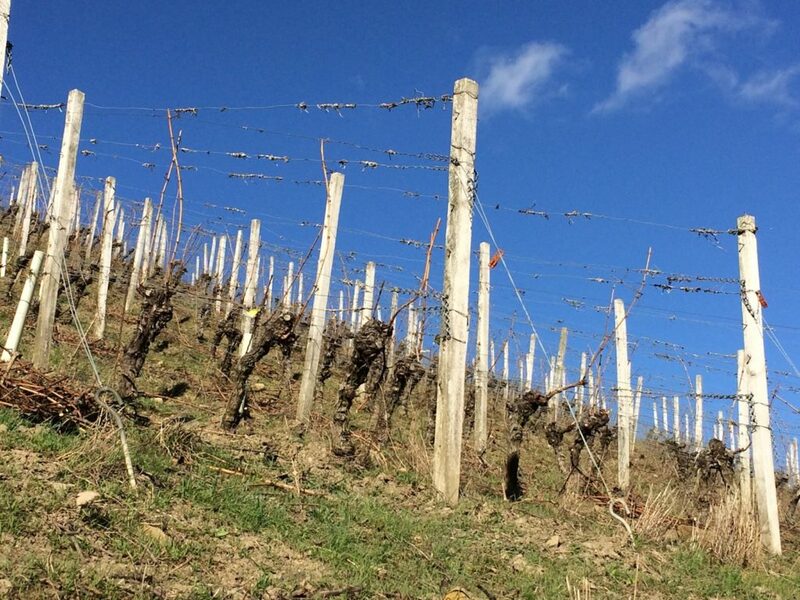 100% des 30 Hektar großen Weinbergbesitzes des Hauses liegt in folgenden Lagen: Hermannsberg (Monopol), Steinberg und Klamm in Niederhausen; Kupfergrube (12 Hektar!) und Felsenberg in Schlossböckelheim; Bastei in Traisen; Rotenberg in Altenbamberg. It is frequently claimed that certain wines have a mineral taste, but often consumers find it hard figuring out just what that special taste is. 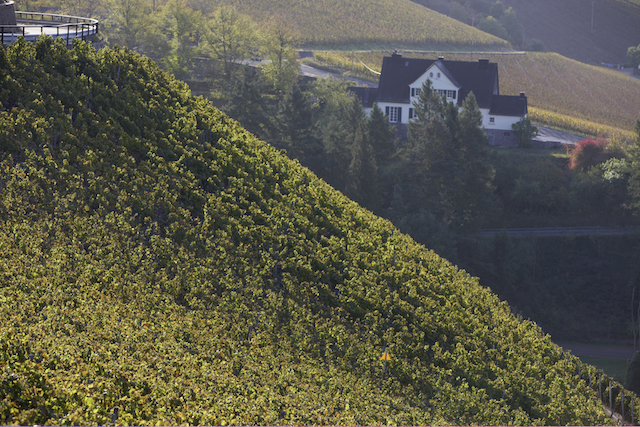 The steep vineyards of GHB all have stony soils that were weathered from volcanic melaphry and rhyolite, of from metamorphic slate. Since generations experts have talked about the special taste of the Riesling wines from these sites. 7 Terroirs is an excellent example of this, offering intense smoky minerality, racy acidity and juicy grapefruit character for a friendly price: just Euro 11,90 to private customers in Germany. The 100% wild-fermented (without cultured yeast added) wine will be bottled shortly and interest is already great. Häufig wird behauptet, dass bestimmte Weine „mineralisch“ sind, doch allzu oft suchen die Konsumenten vergeblich nach dem sogenannten besonderen Geschmack. Die Hang- und Steillagenweinberge von GHB haben ausnahmslos steinige Böden, die aus verwittertem vulkanischen Melaphyr und Rhyolith, sowie metamorphischen Schiefergestein bestehen. Schon vor Generationen wurde der besondere Geschmack der Riesling-Weine aus diesen Lagen von Fachleuten gefeiert und genau das findet man im „7 Terroirs“ wieder. Der 100% spontanvergorene (ohne Zusatz gezüchteter Hefen) Wein hat eine sehr ausgeprägte rauchig-mineralische Note, viel Rasse und eine wunderbare Saftigkeit für den freundlichen Endverbraucherpreis von Euro 11,90. Die Abfüllung folgt im späten März aber das Interesse ist schon sehr groß. I just started as Riesling Ambassador for the Gut Hermannsberg (GHB) estate in Niederhausen/Nahe and, of course, I spent some time getting to know my new desk, where I wrote and translated a row of texts for the fast approaching ProWein trade fair in Düsseldorf. However, I also discovered lost world of wine. Vor wenigen Tagen habe ich angefangen als Riesling Ambassador für Gut Hermannsberg (GHB) in Niederhausen/Nahe zu arbeiten. Ich habe natürlich einige Zeit an meinem neuen Schreibtisch verbracht, wo ich Texte für die bevorstehende ProWein-Messe geschrieben und übersetzt habe. Ich habe aber auch eine verlorene Welt für mich entdeckt. It started during an extensive tasting of the current range of GHB wines, plus fast approaching additions to that range from the exceptional 2018 vintage. “Rotenberg,” said winemaker Karsten Peter softly as he poured me the first of the 2017 GGs, a dry Rieslings from the Rotenberg site. It was not the most breath-taking wine of the tasting, but it was extremely striking thanks to its smoked bacon character. Smoke is what I associate with the red Syrah grape and I never tasted a Riesling like this before! It was married to ripe peach aroma that the intense mineral character and strident acidity were beautifully balanced. Das fing bei einer Verkostung der aktuellen Weine an, sowie auch die bald dazu kommenden Gewächse des herausragenden Jahrgangs 2018. “Rotenberg” sagte mir Winemaker Karsten Peter leise, als er mir der erste von den 2017er GGs des Hauses, einen trockenen Riesling aus der Lage Rotenberg. Es war nicht der atemberaubendste Wein der Verkostung aber er stach heraus mit seiner Räucherspecknote. Dieses Aroma assoziiere ich normalerweise mit Rotweinen der Traubensorte Syrah. So was habe ich bei einem Riesling noch nie erlebt! Und es war mit genug Pfirsichfrucht gepaart um die mineralische Note und betonte Säure wunderbar zu balancieren. GHB has a reputation for charging rather serious prices for their top wines, at least within the moderately priced context of the Nahe region that is. 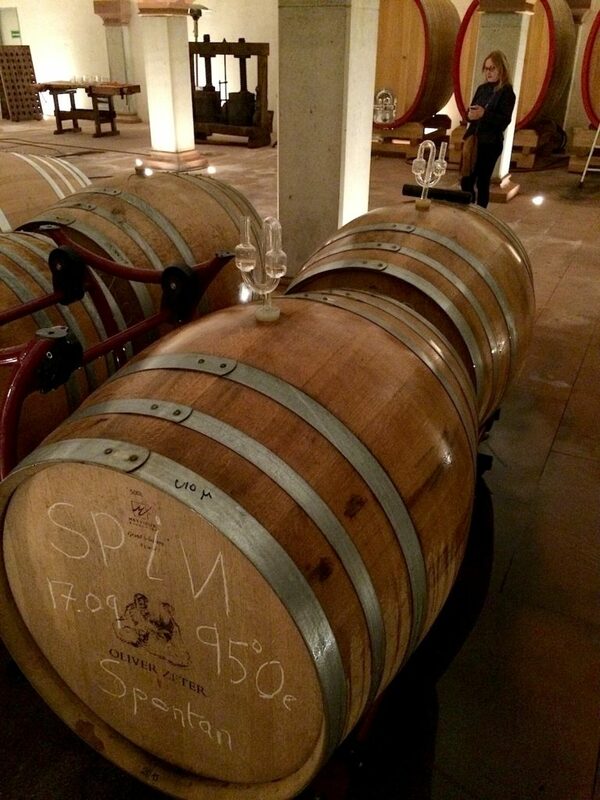 However, the 2017 Rotenberg GG is just Euro 26 to private customers direct from the estate, or just over half of the Euro 48 that the breath-taking 2016 Kupfergrube GG costs. This is because the Rotenberg is nowhere near as famous as the legendary Kupfergrube, and this remarkable wine therefore sometimes get’s overlooked. I’d always liked the Rotenberg wines, but never really “got” them before. Now I really do, and the fact they’re underdogs also makes them appeal to me! GHB hat der Ruf, recht hohe Preise für seine Spitzenweine zu verlangen – zumindest innerhalb des eher günstigen Kontexts der Nahe. Mit Euro 26 für Privatkunden ab Hof kostet der 2017er Rotenberg GG nur etwas mehr als die Hälfte des großartigen 2016er Kupfergrube GGs (Euro 48). Die Lage Rotenberg ist unbekannt in Vergleich mit der legendären Kupfergrube und deswegen wird sie manchmal übersehen. Ich habe die Rotenberg-Weine immer gemocht aber erst vor wenigen Tagen richtig geschnallt. Ihr Underdog-Status macht sie für mich auch anziehend! Then, Karsten Peter took me on a long vineyard tour that ended in the Rotenberg. Suddenly, Karsten’s jeep pulled up at the edge of the hill country into which the Alsenz Valley is deeply cut. With not quite 30 hectares of vineyards it is composed of a series of steep and rugged islands of vines surrounded by woodland and scrub, the later on the slopes where vineyards used to be. No doubt the season accentuated the wildness of the place and it reminded me of a painting by Bruegel. On a distant hill stood a castle. Of course, we’re in The Real Germany! Dann nahm mich Karsten Peter mit auf eine lange Weinbergstour, dessen Endziel der Rotenberg war. Plötzlich hielt sein Jeep an der oberen Kante des engen Alsenztals in das wir hinab blickten. Nicht ganz 30 Hektar Weinbau gibt es noch hier. Es gibt eine Reihe von steilen und schroffen Rebinseln, umgegeben von Wald und Gestrüpp (letzteres auf den Hängen wo es mal Weinberge gegeben hat). Zweifelsohne hat die Jahreszeit die Wildheit dieser Landschaft betont. Es erinnerte mich an ein Landschaftsgemälde von Bruegel. Auf einem Berg in der Ferne stand eine Burg. Selbstverständlich! Wir sind doch im wahren unverbrauchten Deutschland! We climbed out of the jeep and as I vainly tried to get a sharp photograph of him in the blustering wind Karsten showed me bedrock where it was exposed at the side of the road. 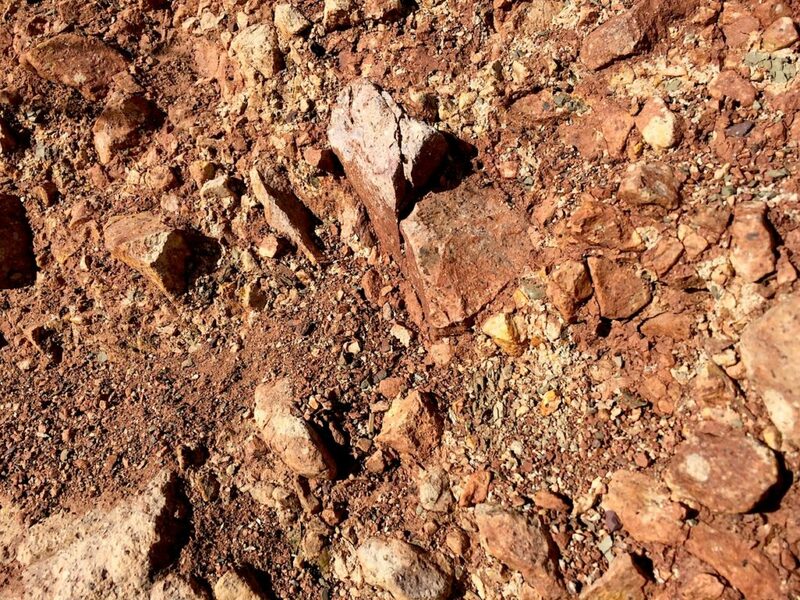 It is composed of red volcanic rhyolite with a small amount of what local winemakers call Tonschiefer, or clay slate. It made me think of the surface of Mars! 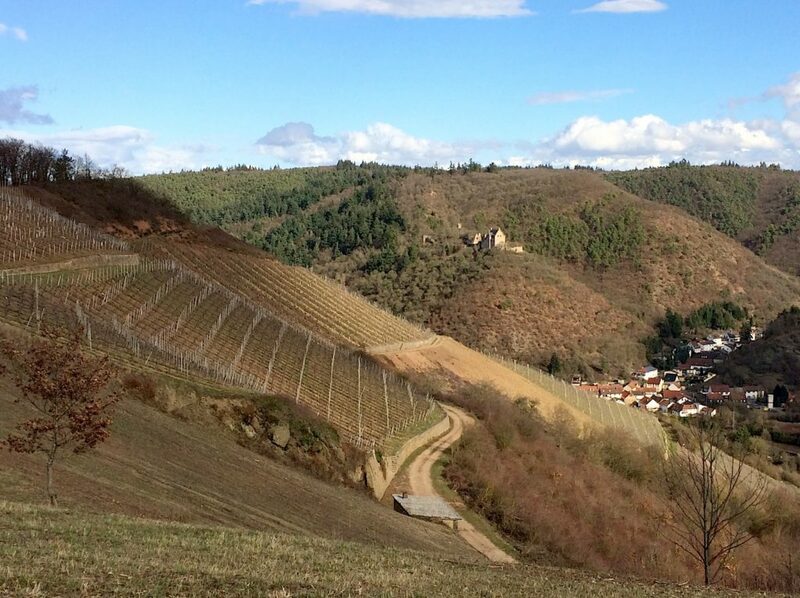 Together with this precipitous south-facing slope, it surely leads to that special personality of the wines. 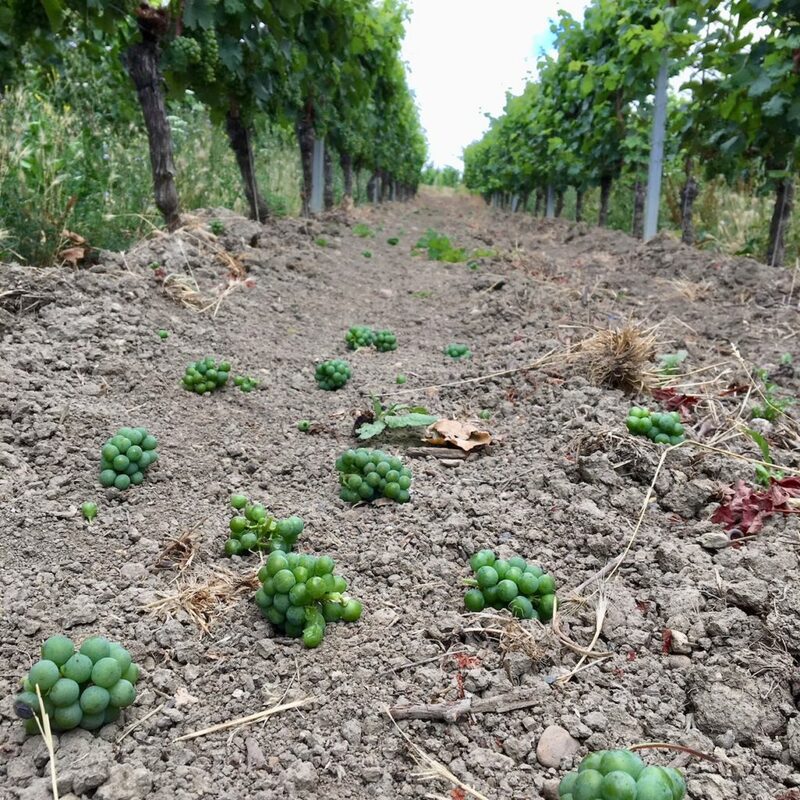 GHB has almost 3 hectares of Riesling planted in the Rotenberg and the ground has been cleared and prepared to plant another 1 hectare, because we believe in it. Considering I never had a bottle of Rotenberg Riesling in my extensive cellar I’d say it counts as a lost world of wine! Wir stiegen aus dem Jeep und als ich vergeblich versuchte ein scharfes Bild von Karsten, trotz heftigem Wind zu knipsen, zeigte er mir den Fels, wo er an der Straßenkante freigelegt ist. Er besteht vorwiegend aus rötlichem vulkanischen Rhyolit mit etwas Tonschiefer. Es hat mich an die Marsoberfläche erinnert! Zusammen mit diesem nach Süden exponierten Steilsthang, führt es zu diesem besonderen Wesen des Weins. GHB besitzt fast 3 Hektar Reben hier und wird bald noch 1 Hektar dazu pflanzen, weil wir daran glauben. In Anbetracht der Tatsache, dass ich nie eine Flasche Rotheberg in meinem weitläufigen Weinkeller hatte, würde ich sagen, es ist eine wahre verlorene Welt des Weins! Here is the text of the press release that Wine + Partners sent out on Monday, 25th February. Bitte nach unten scrollen für die deutschspachige Version. 35 years ago Stuart Pigott visited Gut Hermannsberg, then the Staatliche Weinbaudomäne Niederhausen-Schloßböckelheim or Nahe State Domaine, for the first time. That moment is recorded in his diary entry for Thursday, 26th April 1984 where his order for several of the wines he tasted that day is also noted. “I’ll never forget my very first sip of Kupfergrube, I was totally amazed and fascinated,” recalls the British born journalist. Since then he has devoted himself to studying the Rieslings of Planet Wine, but those from the Nahe have always had a special place in his heart. After many adventures in the big wide world of wine, the last of which was as Contributing Editor for James Suckling, one of the world’s most influential wine critics, Pigott returns to Germany to live out at least a part of his fascination for Riesling in the beautiful and dramatic Nahe Valley. Stuart Pigott’s decision has a great deal to do with the fact that this year Gut Hermannsberg celebrates an important anniversary. 10 years ago the estate, founded in 1902 by the Prussian State, was purchased by Jens Reidel and Christine Dinse. As a result of many carefully planned investments, and through the sensitive leadership of winemaker Karsten Peter, Gut Hermannsberg has climbed back into the first league of German wine. Stuart Pigott followed this process in detail and he showered praise upon the wines Karsten Peter made from the last vintages (see www.JamesSuckling.com), particularly those from the great Hermannsberg, Kupfergrube and Bastei vineyard sites. In fact, all the estate’s 30 hectares of vineyards are classified VDP Grosse Lage, or “Grand Cru”. Stuart Pigott will play an important role in that process. 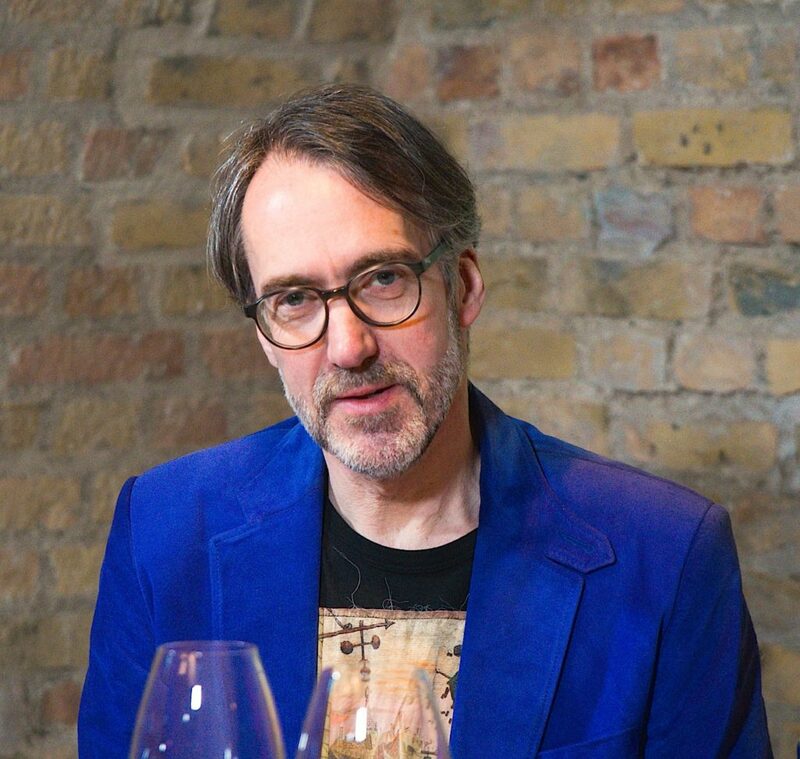 His enormous experience with Riesling wines that reflect the geology of the vineyard, and his ability to communicate their qualities outside the conventions of modern winespeak, will be no less important for Gut Hermannsberg than his critical and analytical faculties or his global network of connections. During their anniversary year in parallel to his journalistic work Stuart Pigott will be Gut Hermannsberg’s „Riesling Ambassador“. He will bring his skills as a wordsmith to texts describing the development of the estate and its remarkable wines during the last decade, and he will present the estate’s Riesling wines at a series of tastings for professionals in Germany and around the world. Vor 35 Jahren besuchte Stuart Pigott zum ersten Mal Gut Hermannsberg, das damals noch Staatliche Weinbaudomäne Niederhausen-Schloßböckelheim hieß. So steht es in seinem Terminkalender vom April 1984 eingetragen, und gleich daneben die Bestellung, die er tätigte. “Als ich den ersten Schluck Kupfergrube auf der Zunge hatte, war ich sofort fasziniert und begeistert!” schwärmt der gebürtige Brite, der sich seit Jahrzehnten mit Riesling auseinandersetzt, und das Nahetal besonders ins Herz geschlossen hat. Nach vielen Abenteuern in der Weinwelt, die ihn zuletzt an die Seite von James Suckling gebracht hatten, kehrt Pigott nun ganz nach Deutschland zurück und wird zumindest einen Teil seiner Begeisterung für Riesling an der Nahe ausleben. Denn die einstige Staatliche Domäne feiert ein Jubiläum: vor zehn Jahren wurde das 1902 gegründete Weingut durch Jens Reidel und Christine Dinse erworben. 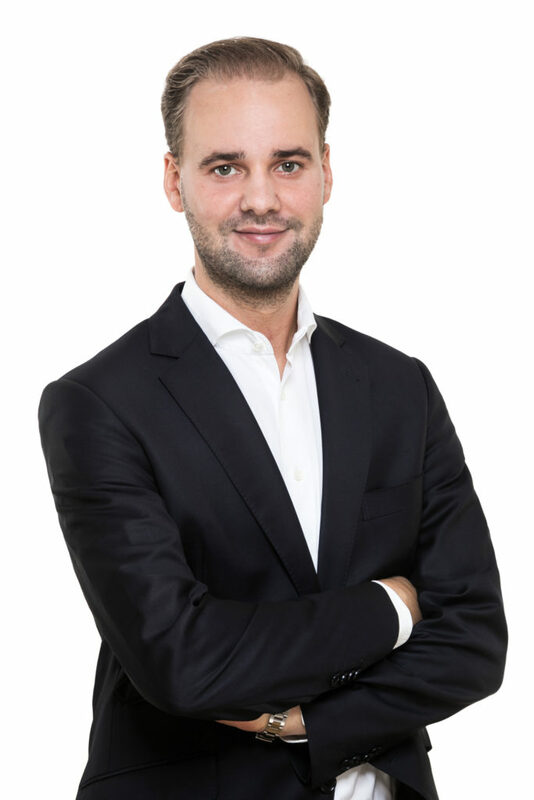 Dank vieler Investitionen und unter der umsichtigen und respektvollen Führung durch Karsten Peter hat das Paradegut Schritt für Schritt wieder den Anschluss an die absolute Spitze in Deutschland geschafft. Stuart Pigott war all die Jahre ein aufmerksamer Beobachter der Entwicklungen und freut sich ganz besonders über die tollen Qualitäten, die Karsten Peter aus dem Hermannsberg, der Kupfergrube oder der Bastei entwickelt. Sämtliche Weinberge des Gutes sind übrigens VDP.Grosse Lagen. Seit einigen Monaten ist Jasper Reidel, Sohn von Jens Reidel, aktiv in der Geschäftsführung tätig. Gemeinsam mit Achim Kirchner (Verkauf) und Karsten Peter (Produktion) planen die drei nun die weitere Zukunft des außergewöhnlichen Weingutes. „Das Jahr 2019 ist ein sehr wichtiges für uns; wir haben eine Dekade lang Aufbauarbeit in allen Bereichen geleistet. In den Reben haben wir nachhaltige Bewirtschaftung umgesetzt, die Erträge haben wir reduziert, die Qualität sukzessive gesteigert. Wir haben eine neue – kupferfarbene – Kelterhalle errichtet und ein Gästehaus eröffnet. Bis zum Sommer werden wir nun noch den Degustations- und Verkaufsbereich neu gestalten. Dann ist alles bereit für ein glänzendes Fest und eine noch glänzendere Zukunft!“ freuen sich Jens Reidel und Christine Dinse. Stuart Pigott wird eine wichtige Rolle in der Vorbereitung dieser Zukunft spielen. Seine Erfahrung und sein Enthusiasmus für Riesling von geologisch-spannenden Herkünften, seine mitreißende Art, über große Weine zu schwärmen, seine Sprachgewandtheit und sein internationales Netzwerk, aber auch sein kritischer Blick machen ihn zum idealen Partner. Neben seinen weiteren journalistischen Tätigkeiten wird Stuart Pigott für Gut Hermannsberg ab März 2019 in dem Jubiläumsjahr als „Riesling Ambassador“ tätig sein und überall dort unterstützen, wo er seine Kompetenz und seine Begeisterung in gleichem Maße einbringen kann: bei der akribischen Aufarbeitung von Texten und Dokumenten der letzten 10 Jahre, bei der Vorstellung und Erläuterung der Weine, bei Degustationen mit Fachpublikum aus aller Welt und bei Events mit Weinliebhabern. Für den deutschsprachigen Text bitte runter scrollen. For the last two and a half years I worked as Contributing Editor for JamesSuckling.com and it was a great journey of discovery. Thanks to James, and with the help of his great team, I was able to learn an enormous amount about the wines of Bordeaux, Beaujolais, Alsace, Spain, Italy, Chile, Argentina, California and New Zealand. Together we also expanded the website’s reporting to include the wines of Germany, Austria, the East Coast and Midwest of the USA. This exciting and hectic period is about to end: on 1st March 2019 I depart from JamesSuckling.com. Half a year ago I got married and Eppstein im Taunus/Germany, where my wife has lived for almost 20 years, became my new home. I want to spend more time there with her and to further develop my business. Since I qualified from the Royal College of Art in London on the 6th July 1986 I’ve been a freelance wine journalist, and I will continue to work as a writer. However, for various reasons I’ll no longer rate wines on numerical systems. I’ve absolutely nothing against wine guides, magazines and online publications that report on wines in this way, but in the future I won’t work for them. Telling the many-sided story of wine has always been the focus of my work. For example, in April I’ll travel to the Jerusalem Hills in Israel to write a German-language article about the rising stars of this region for Effilee magazine. More news will follow shortly! Gut zweieinhalb Jahre war ich als Contributing Editor bei JamesSuckling.com tätig, und es war eine großartige Entdeckungsreise. Dank James und der Unterstützung durch sein erstklassiges Team habe ich enorm viel über die Weine aus Bordeaux, Beaujolais, Elsass, Spanien, Italien, Chile, Argentinien Kalifornien und Neuseeland gelernt. Dazu haben wir die Berichterstattung der Website um die Weine aus Deutschland, Österreich, die Ostküste und Mittleren Westen der USA erweitert. Dieses aufregende aber auch hektische Kapitel meines Lebens werde ich aber bald abschließen. Am 1.März 2019 verlasse ich JamesSuckling.com. Vor einem halben Jahr habe ich geheiratet und dadurch einen neuen Lebensmittelpunkt in Eppstein im Taunus gefunden, wo meine Frau Alexandra Pigott seit vielen Jahren lebt. Ich möchte mehr Zeit hier und mit ihr verbringen, und mich geschäftlich weiterentwickeln. Seit ich das Royal College of Art in London am 6. Juli 1986 absolviert habe bin ich freischaffender Weinjournalist. Und das werde ich auch in Zukunft bleiben. Aus mehreren Gründen werde ich aber keine Weine mehr nach numerischen Systemen bewerten. Ich habe gar nichts gegen WeinGuides, Magazine und Online-Publikationen, die auf diese Art und Weise über Wein berichten, aber ich stehe dafür zukünftig nicht mehr zur Verfügung. Für mich ist es nach wie vor die vielseitige Geschichte des Weines, die mich interessiert und die ich erzählen möchte. Zum Beispiel werde ich im April zu den Jerusalem Hills in Israel fahren, um einen Bericht über die aufstrebenden Weingüter des Gebiets für das Effilee Magazin zu schreiben. Seit geraumer Zeit wird unsere Welt dank technischen Fortschritts und Globalisierung immer mehr genormt und geglättet. Einige wenige Dinge trotzen hartnäckig dieser Entwicklung und bleiben eigenständig, manchmal sogar einmalig. Dazu gehören die Riesling-Weine aus den Spitzenlagen von Rhein, Mosel, Nahe, Main, Neckar, Donau, Krems, Kamp und deren Nebenflüsse. Die besten unter ihnen sind strahlenden Singularitäten, und meine Hauptaufgabe war es immer, Worte zu finden, die das wiedergeben, was sich in den Tiefen dieser Ausnahme-Gewächse verbirgt. Diesem Ziel, werde ich in Zukunft noch mehr verpflichtet sein, und ich freue mich sehr darauf. Weitere Nachrichten werden bald folgen! Beijing Wine Diary: Day 0 – Weinweiblich Live kommt bald! / Wine Women & Rhine Live is coming soon! Ab 18 Uhr am Abend von Freitag, den 23. 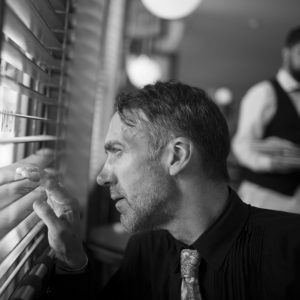 November, ein ganzes Jahr vor dem offiziellen Release von dem Dokumentarfilm Weinweinblich, gibt es in der Scheune von Weingut Joachim Flick in Flörsheim-Wicker/Rheingau ein Screening mit dem Regisseur Christoph Koch. Dazu präsentieren acht der beste Winzerinnen Deutschlands ihre Weine: Theresa Breuer von Weingut Georg Breuer in Rüdesheim/Rheingau, Katharina Flick von Weingut Joachim Flick, Rebecca Matterne von Weingut Matterne & Schmitt in Winingen/Mosel, Dörthe Näkel von Weingut Meyer-Näkel in Dernau/Ahr, Dr. Eva Vollmer von gleichnamigen Weingut in Mainz-Ebersheim/Rheinhessen, Carolin Weiler von Weingut Weiler in Lorch/Rheingau, Andrea Wirsching von Weingut Wirsching in Iphofen/Franken und Silke Wolf von Shelter Winery in Kenzingen/Baden. Es gibt viel Riesling aber viele andere Weine, inklusive Rotweine. Ab 21 Uhr gibt es Party mit DJ Bobo! Hier ist der Link zum Flyer. Jetzt ist die Zeit eine Eintrittskarte für €25 zu bestellen! For quite some time I have been working with director Christoph Koch and producer Gunnar Swanson on documentary movie Weinweiblich, aka Wine, Women & Rhine. From 6pm on the evening of Friday, 23rd November in the barn at Weingut Joachim Flick inFlörsheim-Wicker/Rheingau, a full year before the official release of the movie, there will be a sneak preview screening of material shot for it. 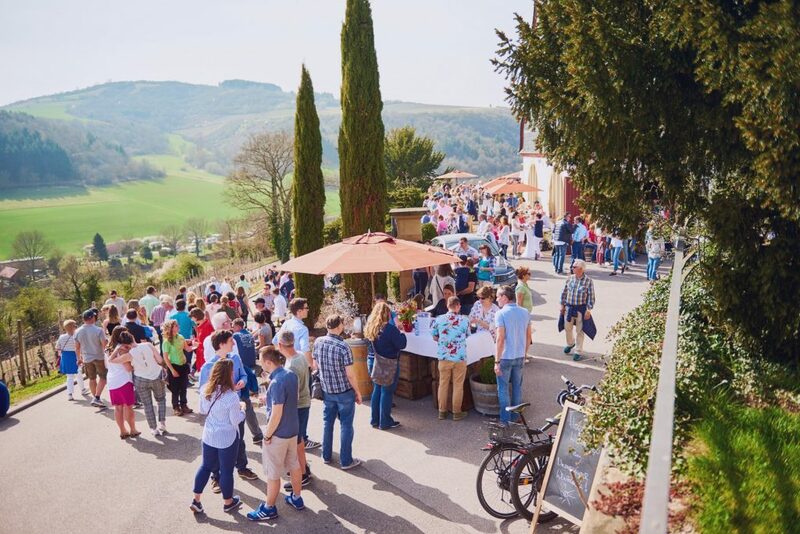 Also eight of Germany’s top women winemaker will be pouring their wines: Theresa Breuer of Weingut Georg Breuer in Rüdesheim/Rheingau, Katharina Flick of Weingut Joachim Flick, Rebecca Matterne of Weingut Matterne & Schmitt in Winingen/Mosel, Dörthe Näkel of Weingut Meyer-Näkel in Dernau/Ahr, Dr. Eva Vollmer of the eponymous estate in Mainz-Ebersheim/Rheinhessen, Carolin Weiler of Weingut Weiler in Lorch/Rheingau, Andrea Wirsching of Weingut Wirsching in Iphofen/Franken and Silke Wolf of Shelter Winery in Kenzingen/Baden. 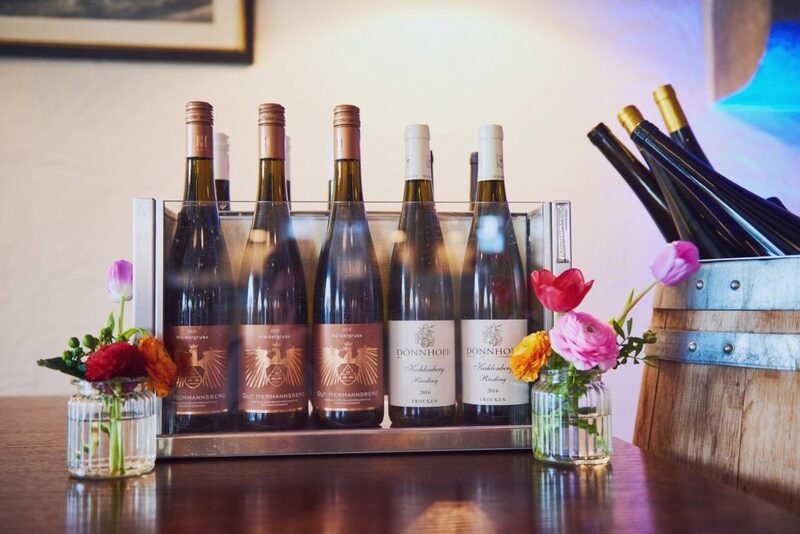 There will be plenty of Riesling, but also a wide selection of other wines (also some reds), and from 9pm there will be dancing to the cosmic vibrations of DJ Bobo! Now is the time to order a ticket for just €25! Hinweis: Das Foto oben zeigt der ursprüngliche Winzerin-Team mit mir beim ersten Dreh in Dezember 2017. Seitdem hat Katharina Wechsler vom gleichnamigen Weingut in Westhofen/Rheinhessen (zweiter von links) aus persönlichen Gründen das Projekt verlassen. Zu den drei anderen Winzerinnen ist Anfang 2018 Carolin Weiler dazugekommen. Note: The photo above shows the original group of women winemakers with me on the first day of shooting back in December 2017. 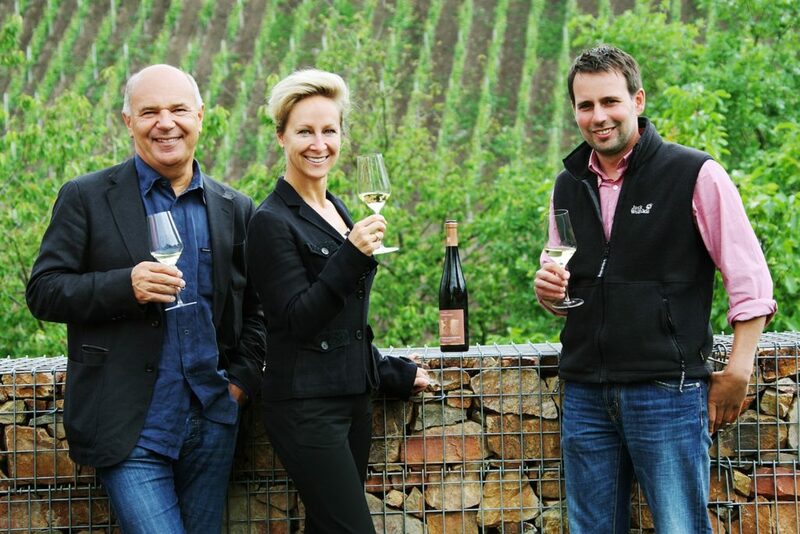 Since then Katharina Wechsler of the eponymous estate in Westhofen/Rheinhessen (second from the left) had to leave the project for personal reasons. 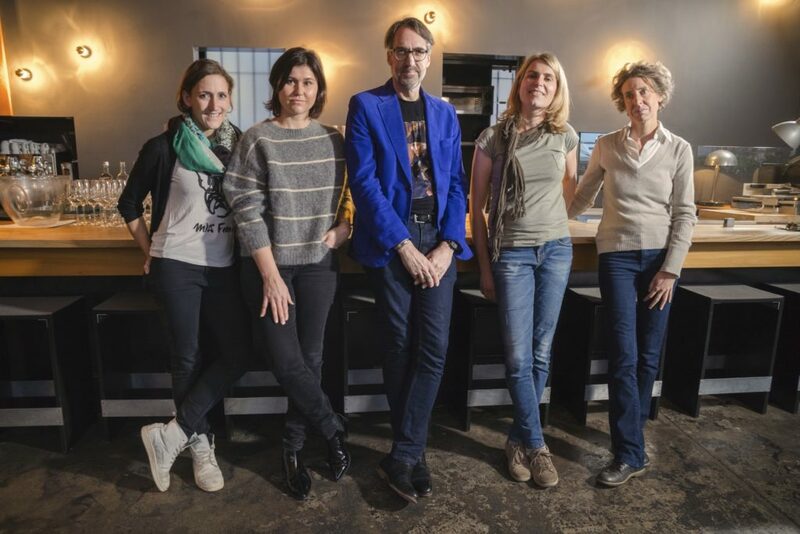 The other three women winemakers in the picture were joined by Carolin Weiler early in 2018. 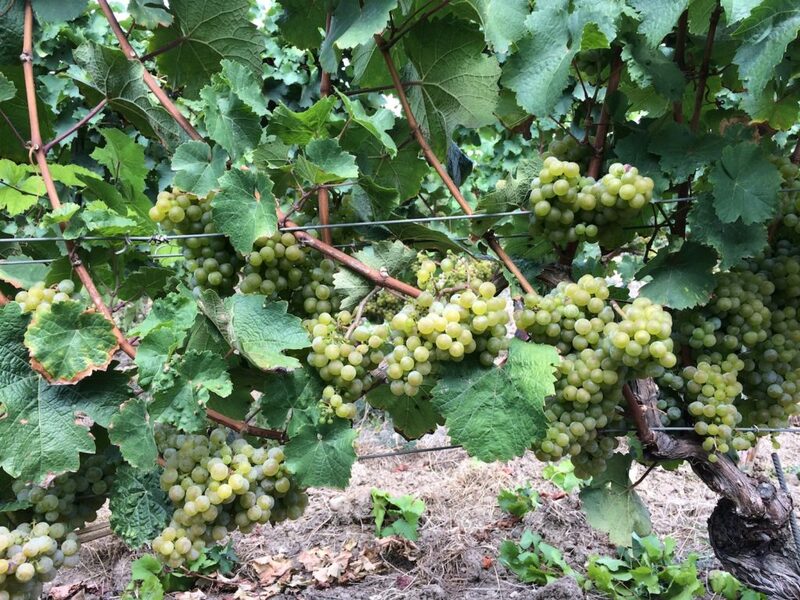 London Wine Diary: Day 1 – IT LIVES! My 2018 Nonnberg Riesling for Wein Weiblich the Movie is fermenting! IT LIVES! My two 500 liter barrels of Riesling picked in the early morning of Monday, 17th September in the Nonnberg site of Wicker/Rheingau are now both fermenting. Both barrels were filled with the same must late on the evening of the day of harvest. The one at the front of the picture is very slowly undergoing spontaneous or wild fermentation, while the one behind it was inoculated with Heiligenstein yeast and is fermenting much faster. The goal is a bone dry wine and based on the most weight of 95° Oechsle (straight from the press) I expect the wine to weigh in at around 13% alcohol. Due to a pH of 3.5 in the must, which means very low acidity, I felt there was no option, but to add 1.5 grams per liter of tartaric acid. Some of you will hate me for doing that, because it’s not “natural”, but if I hadn’t done that the danger of an unwanted malolactic fermentation would have been high, and then the wine might have ended up tasting like melted butter. This is Riesling, not warm climate Chardonnay, so no thank you! Sadly, there’s no point in describing how the fermenting wine tastes now, because it will change from day to day or even hour to hour. I will start talking about the aromas and flavors after alcoholic fermentation is completed and a small amount of sulfites have been added to prevent oxidation. I want the finished wine to live for at least a decade and for that there’s no serious alternative to adding sulfites. Then the wine and its flavors will gain a certain stability. I won’t be hurrying to add that sulfur though (by the way, none was added either to either the grapes or the must), because the longer it is delayed the more chance the wine has for positive aromatic development. As those of you who have been following my work in the 6 rows of Riesling vines I borrowed for the year from Reiner Flick of the Flick estate already know, I am making this wine for Wein Weiblich aka Wine, Women, Rhine the movie. De facto I am in competition with four talented young professional women winemakers, each of whom is also making a 2017 vintage dry Riesling in front of the movie camera. As the only amateur winemaker in the group I am clearly the one who’s wine is most likely to bomb out in the final scene of the movie: a blind tasting of the finished products at Restaurant Heimat in Frankfurt in early July 0f 2019. At the beginning I was sure that I could only fail that test, then I acquired a very capable assistant called Peam Saisombat and that changed the calculation of my chances quite considerably. 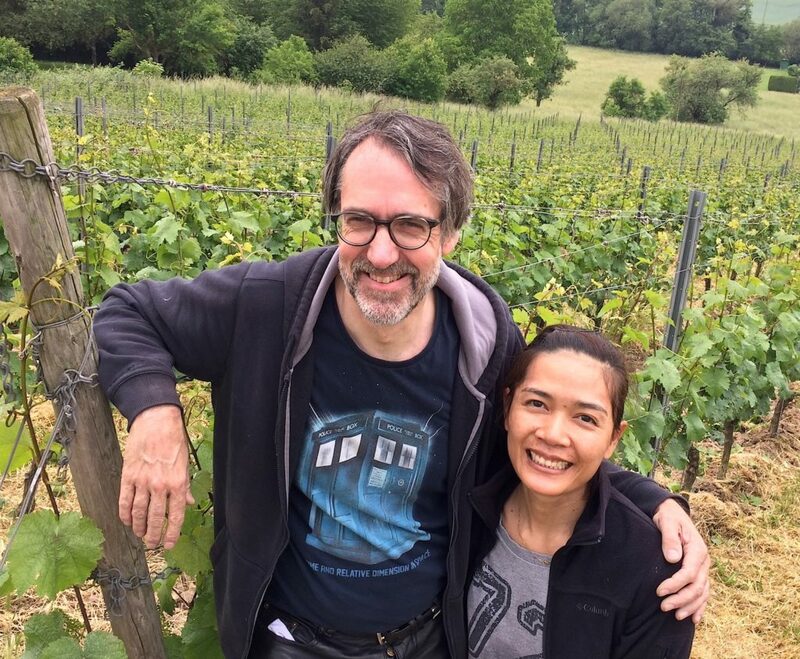 She is from Thailand where she already has a degree in agricultural science and is studying winemaking at the Geisenheim Wine University. Here we are together in the vineyard after the end of a hard day’s work. To give you an idea of how precise Peam’s vineyard work is here are a few photographs she took to document work she did alone in the vineyard (necessary when I was in Spain in late June and in Italy in August for JamesSuckling.com). The first photograph shows the result of twisting the vine shoots around the top wires rather than cutting the tips off them as conventional winegrowers do. The theory behind not cutting the growing shoot tips is that they provide competition for energy and nutrients to the developing bunches, which remain smaller and looser than would normally be the case if the tips remain intact. The contrast to the rows of vines on the left of the photograph that Reiner Flick’s team cultivated is immediately obvious. The canopy of our vines is lower and I am sure that during the long hot and dry months of the summer they used less water than the vines on the left. Something else that we did that was different to Reiner Flick was to “halve” the bunches of grapes that struck us as being too fat and compact. Because I was on the road Peam did this by herself. No knife was necessary, just two hands a sharp eye (which she certainly has!) She grasped the upper part of the bunch with her left hand, then twisted off the lower third with her right hand. The theory is that shocked by the wound this inflicts on the vine it tries to compensate for the lost fruit by stretching the bunch, which once again loosens it. A loose bunch is much less likely to rot and the berries at the back of it also get more light exposure. Here’s a picture that also gives an idea of how this procedure also reduced the yield somewhat. In fact, ripening as measured through the sugar content of the grapes progressed rather fast until the drought pulled on the brakes somewhat at the beginning of September. However, I feel pretty sure from the way the grapes tasted at harvest that the aromatic development during the last couple of weeks before harvest continued apace. 2018 is a really extreme vintage thanks to the heat and drought. My gut tells me that in some vineyards quality will be low because the vines were too stressed during the summer. My guess is that this will not only vary from village to village, but also from vineyard plot to vineyard plot depending on how well each has been tended over the last years. 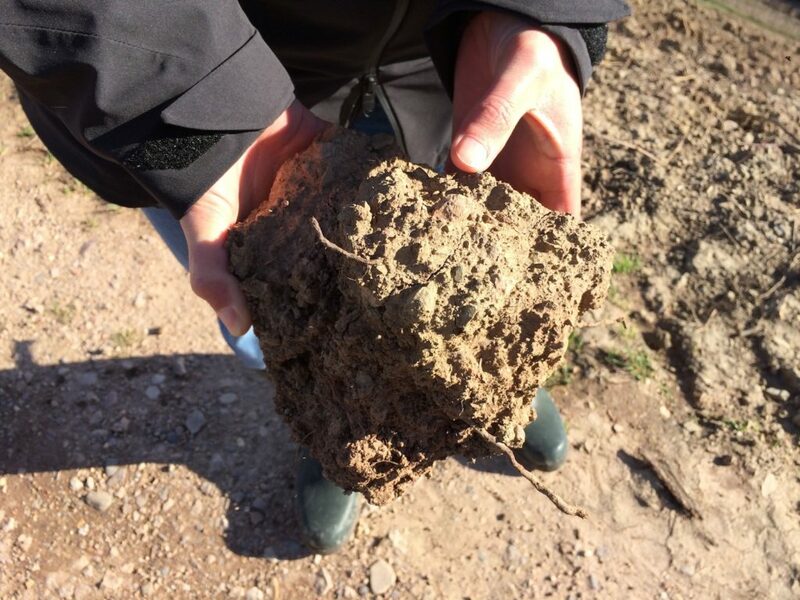 I think the special conditions in Wicker (in particular the very water-retentive soil), Reiner Flick’s very thoughtful cultivation and our own hard work prevented us being affected by that problem. If the very generous yield – much higher than 2017, 2016, 2015, 2014 0r 2013 – impacts quality is difficult to say now. The entire harvest team was in agreement that the grapes tasted really good at picking and we removed every berry we could find (it was only isolated berries) that looked less than perfect. It was less than 1% of the fruit! Samstagabend, den 15.09.18 findet an einem geheimen Ort im Rheingau meine offizielle Betriebsfeier zum 35. Jubiläum meiner Tätigkeit als Weinjournalist statt. Wer eingeladen ist, weiß wo und wann. The official celebration of my 35th anniversary as a wine journalist takes place on the evening of Saturday, 15.09.18 at a secret location in the Rheingau. Those who are invited know who they are, where and when. 2016 habe ich New York aufgegeben und bin nach Eppstein/Taunus gezogen. began to work as a Contributing Editor for www.JamesSuckling.com. Anfang 2016 das dritte und vorläufig letzte Band. 2015 my first e-book Rock Stars of Wine America #1 appeared on Kindle. the third and final one appeared early in 2016. Riesling (Tre Torri, Wiesbaden) appearing later the same year. Square/Manhatten und an Bedford Avenue in Williamsburg/Brooklyn. finally on Bedford Avenue in Williamsburg/Brooklyn. GG-Stil im Winzerhof Stahl in Auernhofen/Franken erzeugt. Stephan Reinhardt geschrieben habe. Andreas Durst hat fotografiert. geworden. Seitdem erscheint meine Kolumne regelmäßig. Frankfurter Allgemeine Zeitung and it still appears there regularly. 1993 bin ich nach Berlin gezogen. 1993 I moved to Berlin. 1989 habe ich London verlassen und eine Wohnung in Bernkastel/Mosel bezogen. 1989 I left London and moved into a flat in Bernkastel/Mosel. komplette Weinlese bei Weingut Dr. Loosen in Bernkastel/Mosel gearbeitet. merchant Philip Eyres and his son Harry Eyres. Fachzeitschrift Decanter in London geschrieben. It seems that in 21st century Britain the truth is a very dangerous substance and those who deal in it like myself represent a danger to social order and will be treated accordingly by the self-appointed defenders of that order. Let me explain. I was supposed to be going to London shortly to speak about the wines from a rather remote place that I know very well. For me and the organizers of this event that was certainly PR, but also something genuinely positive and educational. Then somebody who was invited to the event threatened them with drastic consequences if I was involved in it. I have just withdrawn in order not to cause the organizers any unnecessary problems, but am also making this statement about the background to this naked act of intimidation. The problem for the intimidators was a short talk I gave to a very small audience at Vintners Hall in London on the evening of Thursday, 29th January, 2015. Along with Jancis Robinson and Hugh Johnson I had been asked to speak on the subject on my life and Riesling. My talk was very different to theirs, although like them, all I did was to honestly explained how and why I became involved with the wines of this grape and its homeland in Germany. The British wine merchant Philip Eyres (1926 – 2012) played a decisive role in that process and his motivation for taking me with him on a buying trip to the Mosel, Nahe and Rhine in the spring of 1984 was not only a love for those wines, but also reconciliation for the area bombing campaign of the RAF against German civilians during World War II. In 1946 as a conscript in the British occupation forces he saw what area bombing had done to Hamburg and this shock haunted him for the rest of his life. It was clearly a great comfort to Philip that towards the end of his life he was able to speak about all this and clearly express his compassion for the victims. Nobody except a few revisionists dispute the historical facts of the area bombing of Germany, nonetheless they have often been suppressed because they don’t fit comfortably with the national myth of Britain as the great moral victor of World War II. 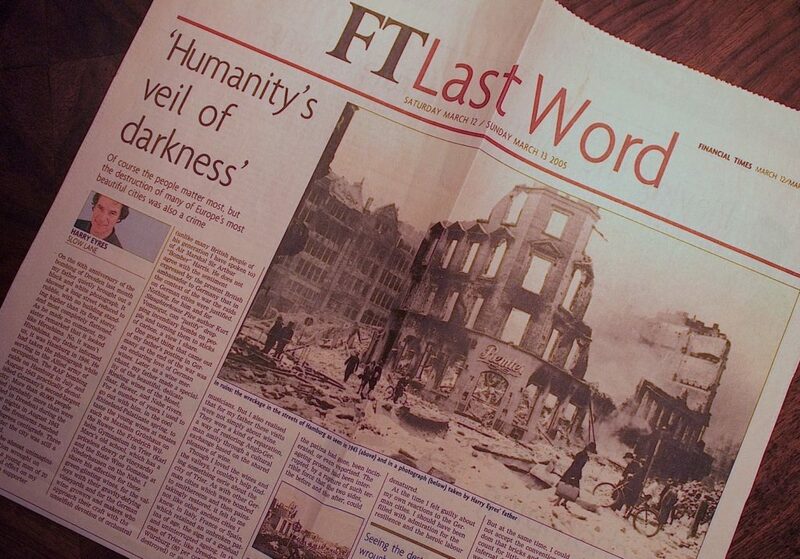 That suppression is the reason that I only found out these truths, and realized the role they had played in shaping my life, when Philip’s son Harry Eyres wrote a column on the subject in the Financial Times in March 2005 (pictured above). I remember how after its publication he experienced a wave of fury for daring to state those historical facts. My attitude was and is that the truth will out. As a trained historian (I have an MA in cultural history from the Royal College of Art) I have a commitment to the truth, even if confronting the past and seeking the truth there is painful. Doing that helps us prevent history from repeating itself. This is an important lesson I learned from the example of Germany sincerely confronting the deeply painful truth of the Shoa or Holocaust and the wider historical context of the persecution of Jews in their country and beyond. I am pretty sure that the person who has taken such exception to what I said that day regards me as unpatriotic and probably thinks that I was being pro-Germany and/or pro-Europe at the expense of Britain. That’s absurd and it would mean that patriotism ought to be built upon selective cognition and censorship. I am happy to be a citizen of Britain and (since a short time) of Germany. Anyone who doubts that please take a close look at the above photograph of me at the celebration of the royal wedding at the British Embassy on Saturday, 19th May. 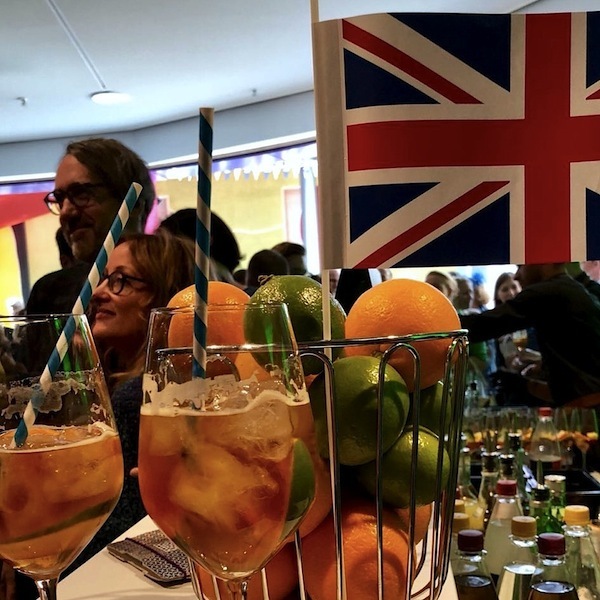 I find the attempt to intimidate the organizers of this harmless wine event in London completely contrary to the democratic traditions of Britain that have valued frees speech for more than 350 years. It strikes me that this action was clearly influenced by the current political climate in my home country. When I was growing up in London during the 1960s and ‘70s political disputes were often heated, but both parties usually retained a basic respect for the other side. Since the campaign for the Brexit vote the language of national politics and the media has become brutal and sometimes sadistic. I find it deeply shocking that this poison should have spread to the beautiful world of wine. The text of my short talk can be found as a four part series of postings by clicking on the button Two Wrongs Don’t Make a Right and scrolling down.